How Many Cultured Foods Do I Eat In a Day?Kombucha Margarita and Strawberry Too! To culture your own food you must love and respect microbes. Turning that love into a product puts you on the Cutting Edge. 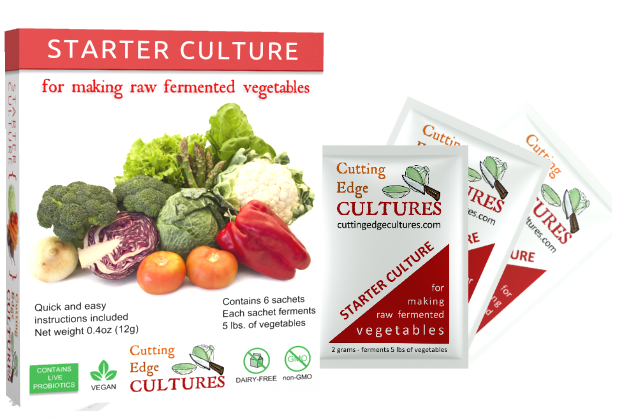 I am very excited to introduce you to Cutting Edge Cultures – Vegetable Starter. Several collaborators knowledgeable on fermentation and probiotics joined together to make the strongest vegetable starter on the market today. I am pleased to be a part of this team and I can’t tell you how excited I am about this product. This starter was sent to the lab and had a PhD peer review against the leading cultures on the market. They also tested it against cultured veggies made with just salt and no starter. The results are impressive and they include the graph to show you the results on every box. One of the most important things you should know about cultured veggies happens in the first 24 hours of fermentation. The faster you can drop the pH in your homemade fermented vegetables, the healthier and safer they will be. 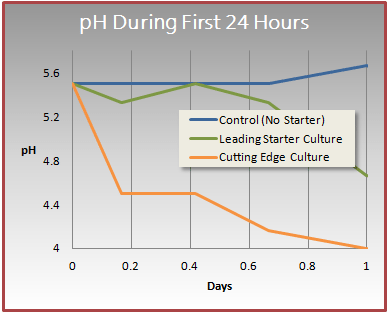 As you can see in these graphs, Cutting Edge Cultures produced dramatically better results than the leading starter culture and the one without a culture.They identified three species of bacteria and probiotics that work best with the fermentation of vegetables. 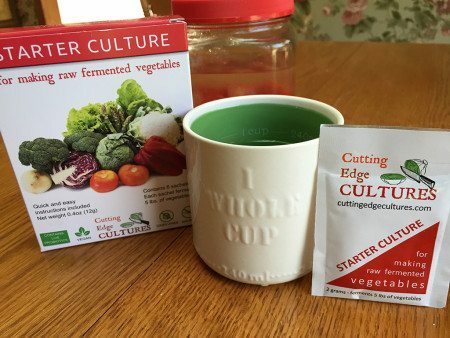 They combined these cultures in numerous blends then tested, tested, and tested and found the perfect combination of balance and strength to make Cutting Edge Cultures the best culture to make your veggies taste delicious but loaded with probiotics too. Cultured foods have been a part of the healthiest diets for thousands of years and are essential to a long, and healthy life. They change the inner ecosystem, and build resistance to infections, help with digestion, appetite and weight control. They also supply the adrenals with extra vitamin C needed to repair and maintain stability. Cultured vegetables change the gut flora and by enhancing the right microbes you can reduce the cravings for sweets, and processed junk food. Research is growing on this powerful bacteria, Lactobacillus plantarum that has an ability to remove chemicals and pesticides from your vegetables and reverse, diseases like IBS, and Colitis. I can’t tell you how exciting this is to me that kitchens across the world will have the ability to turn their own fruits and vegetables into superfoods just by adding this culture. They’ll bubble and ferment on your counter, producing billions of probiotics and then work wonders to heal and strengthen your inner microbiome. If you would like to see more research and information, you can click on this link. 19 Responses to "Cultured Vegetables Made Stronger – Cutting Edge Culture"
I just heard your talk on the Hay House World Summit and would like to start eating cultured vegetables. Should I start off with the Caldwell’s stater culture, or the Cutting Edge Cultures? Cutting Edge Cultures is a great one to start with and my preference but Caldwell’s is good too. Hi Donna, can I purchase this in Australia? Thanks. So very excited about this new product! My goal this summer is getting more fermented foods into our diet. I just purchased some of this new veggie starter! I only have quart-sized jars. Approximately how much powdered started for each jar of veggies. Here are the vegetables that I normally ferment: kraut, julienne carrots, and jicama sticks. Use a quarter package with her quart jar. One package will make a gallon but you can use the brine from that to make more cultured veggies. Hello, I am wondering about how this would compare–and/or how it would change–the fermentation process as it has been practiced for thousands of years. As you state, this is a very old practice. But the use of powdered cultured packets is very new. How does this new culture compare with using Kefir whey as a starter? When thinking about sustainable living, the less we have to purchase, the better. Your expert thoughts are greatly appreciated. Thank you. Thank you Donna! Great information. I’ll be ordering soon. Hi Donna, I already ordered a package of the new starter. I can’t wait to try it. Where is the Apple Cinnamon Kraut recipe that you referred to? Can’t seem to find it. Also, sounds like the Fruity Kraut recipe above makes a large batch. Is it advisable to mix up the cabbage & other ingredients in a large, stainless steel pot before putting into the jars? The largest container that I have is a stainless steel stock pot. Thanks for all you do for all of your followers. This recipe is on this page and yes you can mix them up in a large bowl or pot first. I hope you enjoy the starter! Donna, I have been fermenting my vegetables and love your site. I am excited about the new stater culture, do you not ship to Canada? Thank you Donna,I am also looking forward to be able to order products from your store. 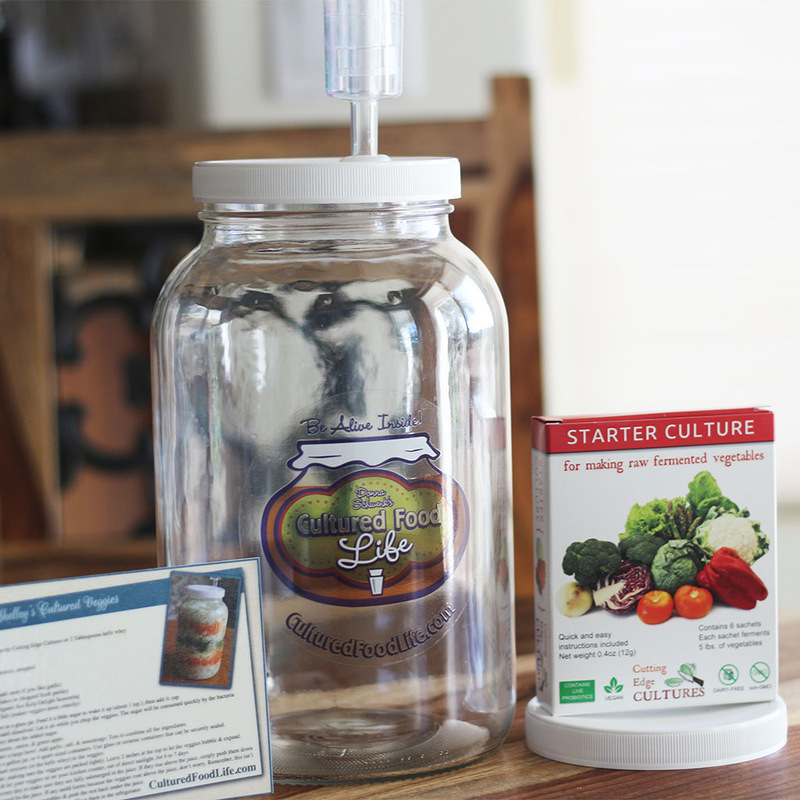 How about using the pickling juice from culture started with your starter to start new batch? Can this continue for additional cultures? Yes you can do this, and it will continue for each batch as long as you so it within a few weeks of making it.